Remote adjust, paint, and match Marshall Cameras without ever having to leave the convenience of a production room or broadcast truck. Match mini POV cameras without an OSD Menu to provide a seamless workflow and next level convenience on multi-view camera displays. Marshall has teamed up with a five-time Sports Emmy award winner to develop a standalone remote RCP solution to adjust, paint, and match Marshall broadcast cameras. 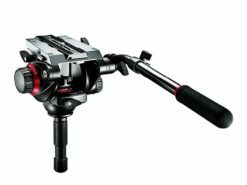 The new 5-inch Touchscreen RCP Camera Control unit allows for remote operation of up to seven broadcast cameras at up to 300m (1,000 foot) distance over common XLR cable, and it features a new intuitive touchscreen control with user-friendly, fine-tune adjustment dials for quick changes on the fly. The touchscreen interface offers self-help dialogs, favorites settings, save features, and intelligent menu and sub-menu layouts. 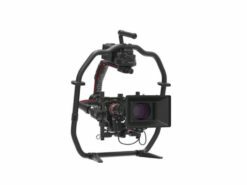 The fine-tune finger dials enable precise adjustments for white balance, red/blue gain, gamma, black level, brightness, exposure, iris, shutter, resolution, frame-rate, and more, and they can be adjusted simultaneously or one at a time. 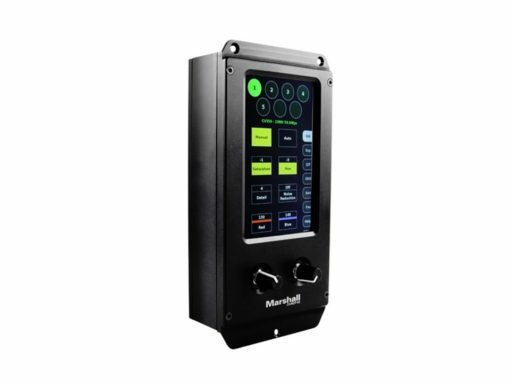 The CV-RCP-V2 comes pre-programmed with control protocols for all Marshall Cameras, including Marshall’s POV cameras, varifocal cameras, zoom cameras, PTZ cameras, as well as other popular non-Marshall branded cameras on the market. Easily convert to fiber using common fiber media converters for much longer distances. Seven cameras are select-able from ALL screen menus with intuitive navigation layout. Global or individual camera adjustment capability without OSD (On-screen Display) Menu appearing on video stream. Adjust Red/Blue, Pedestal (Black-levels), Brightness (AE Offset), Gain, Gamma, Iris, Shutter, Saturation, Hue, Optical/Digital Zoom, Pan-Tilt, Focus, and more. Rugged machined aluminum enclosure provides durability while a larger 5-inch screen provides easier access to digital buttons. 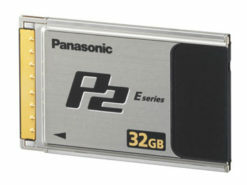 Easy access USB port for field up-gradable firmware and memory saves using USB thumb drives (sold separately). Red and Blue adjustment follows every screen menu with optional Favorites Menu to save important controls to specific events for easy access. Set up multiple cameras with one global preset or multiple presets that are savable on-board the RCP unit or external USB memory sticks. Low power consumption requires 12V power at less than 12W (AC or battery packs).